The coalition government will produce a White Paper which will commit them to look at how local councils can have greater discretion over the business rates. It is mad that councils have little control over the setting of rates locally. Town centres like Bracknell's could be more vibrant if councils can control their own rates. Business rates are set by government, they are collected by the councils and the funds are distributed nationally according to population and other means. I don't have a problem with the government collecting some of this money and these funds being redistributed. But I do think that council's should be able to keep more of the rates collected and to vary the price so that they can keep rates down in certain areas or charge more to those business that can afford them. This would allow small business and independent shops to find their way back into our town centres and high streets rather than the endless charity shops and council should charge more for out of town retail parks. Seeing as a blogger had used my link to Political Compass to do their blog see ' Stuck in the corner with...', I thought I should post mine. I'm going to do this every year just to see if it changes. Political compass is a very interesting web site, it is of course not perfect but its measure of how parties have moved from the left to the right over the years to get to the so called centre ground is revealing. I guess they have just moved with the voters while leaving some left leaning voters behind. Perhaps the Centre ground is not oddly enough in the centre. I am very pleased to see the headline in the Standard 'Tories rebel over housing numbers'. Not least because I worry that the Conservatives have such a large majority that they can do whatever they want without significant opposition. So I'm pleased some councillors from the same party have stood up against them. The rebels are Bracknell Forest Mayor Jim Leake and Bracknell Town Mayor Chas Baily, Councillors Tony Virgo, Robert McLean. Well done to all for asking questions of the majority Conservative group. 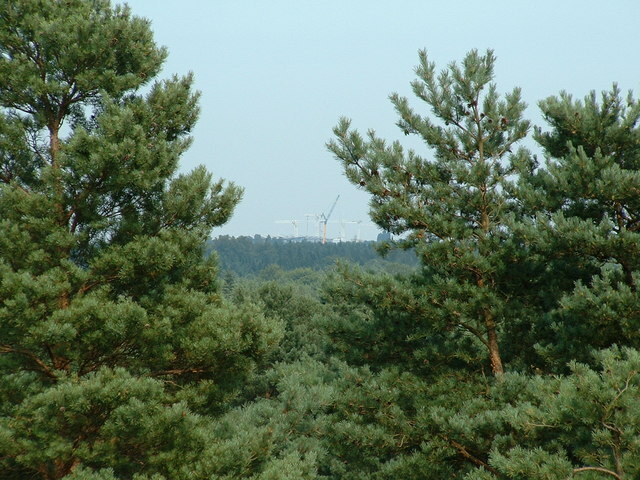 This is because of the planned housing in Binfield and the TRL site Crowthorne. I personally don't have a problem with the redevelopments of Broadmoor Hospital or Amen Corner because I do recognise that these areas to have scope for development and some housing is needed. But I can not understand why there is a plan to build at the Blue Mountain golf course (a popular course and venue) and at the TRL (as I can see this causing traffic problems and taking more green space). This bearing in mind that the Parks and Jeanette Park developments are still building homes. There will be exhibitions in Crowthorne Baptist Church on November 23rd, 10am to 1pm, November 27th, from 10am to 1pm and in the Morgan Centre December 2, from 6pm to 9pm. The Binfield exhibitions will be at Binfield Parish Council offices November 17th from 6pm to 9pm, November 18 from 2pm to 5pm and November 20, from 9am to 1pm. I understand that public spending, capital projects and private investment would boost the economy but there is something else that needs to be sorted in order to ensure that the big spending review gamble works. As recent figures by the British Bankers Association have shown, mortgage take up continues to fall and banks continue to have low levels of lending to small business. So we need the banks to step up their lending of mortgages so they are not as expensive for the lower deposits and banks to lend more willingly to small business. Won't that cover any loss to the economy through the loss of public spending? Can't the government with its ownership of banking shares not have some influence on this? I was listening to Iain Dales LBC radio show last night. One caller said that 95 percent of people are Left Wing. I always find it interesting how some people delude themselves into thinking that their personal made-up fact is some how true and statistically accurate and can therefore make their point stronger. Although this does bring up another question in my mind. How Left or Right Wing is the public, I could not find any UK surveys on this subject. But even if there was one I wonder how many would know where they truly stand. Those of us that follow politics have a good idea as to which side of the political spectrum we fall on but it is less clear to those that don't follow politics amongst the general public. I think most people are Left and Right Wing on a subject by subject basis. For example take Fred who for the sake of argument, believes everything he reads in the newspapers. Fred believes that bankers should pay a large amount of tax on their bonuses (Left Wing), Fred believes that benefits should be cut for those who are lazy and don't want to work (Right Wing), Fred believes we should not accept any more refugees (very Right Wing), Fred believes the NHS should be funded by the public purse (Left Wing). Fred believes that he is paying to much tax (If Low paid Left Wing if highly paid Right Wing). So you see the problem. People don't stick to Left or Right Wing principals but judge things on what they perceive as being fair or unfair to them. This of course party explains the move by political parties to the centre and the more blurred lines between the parties. Hence resulting in Fred telling us that MP we are all the same. 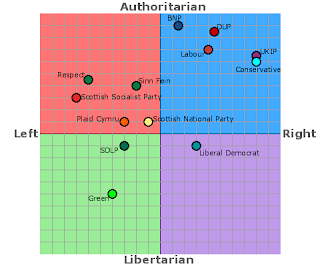 A good way of seeing where you fall on the political spectrum is to use political compass test. A letter to Liberal Democrat MEP's Catherine Bearder and Sharon Bowles. Here we are in a major recession with major cuts in Government expenditure, half a billion jobs to go in the public sector hence the need to rely on the private sector to create more jobs - and what do the bloom'in EU want to do? Hang another millstone around the necks of both public and private sector employers with increased maternity leave payments! AND - that is on top of the EU wanting a 6% increase in their budget for which the UK would have to pay nearly a billion pounds a year more towards! I do hope that neither of you two voted for any of this????!!!!!! Personally, I would welcome more cuts to child related benefits in the UK, including maternity leave! Why? Because there are 6.8 billion people on this finite planet of ours already. Many of them in the richer countries are consuming at the rate of 2, some even 3, and a few even at 5 planets! By 2050 there is projected to be 9 -10 billion people on our planet - i.e. 50% more - all of whom will still be seeking to get richer by yet more economic growth - and thus to be able to consume even more limited resources. Yet, we are also supposed to be cutting CO2 emissions globally by well over 50% by 2050. Yet, every new human arriving on our planet between now and then will be adding to those emissions...............And those arriving in the wealthier countries, like the UK and the rest of the EU, will consume a lot more and emit a lot more CO2 than those arriving elsewhere.......So, how is this going to work then? I ask you, arguing from the standpoint of Sustainability and Climate Change alone, should the EU/UK be encouraging childbirth by increasing maternity leave benefits? Why exactly is it being proposed? The most common argument I hear in favour is that we need to encourage more children so that they will pay for better pensions for us when we get old That is based on the logic of the madhouse. They will all grow old and want even better pensions too, so we will need ever more people ad infinitum - which is clearly unsustainable on a finite planet. This is a ponzi scheme. It is worse than pyramid selling! When we in the UK are already stressed by an overpopulation problem, caused chiefly by immigration, this argument makes no more sense than to suggest that we need to increase our numbers so that we don't get outnumbered by immigrants! Perhaps the real reason behind all this is the EU want more new citizens so as to increase their budget still further, and spread their member states national debts upon?! Should we really be encouraging families in the UK to have more children by offering parents child based benefits that increase with the quantity of their offspring? So, in principal, shouldn't we move towards stopping all child based benefits after the first child? Therefore, apart from helping all parents universally for their first child, it seems to me that (were we able to go back to the beginning again rather than starting from where we are now!) the only absolutely fair, perfectly reasonable and logically sound reason to assist parents financially beyond that is solely on the basis of need. The state should be acting as a taxpayer funded charity organisation, only upon the unexpected loss of employment or unfortunate onset of ill health etc - when and while the parents are struggling to support themselves, let alone more children than their first child. Such assistance should never ever be provided indefinitely except in extreme cases. Might you agree with this supposition, in principle at least? I would be very interested to hear your thoughts on these matters! Sharon did not support amendments in the Parliament to the Pregnant Workers Directive which sought to provide 20 weeks full time maternity pay. While she supports moves for increased gender equality and for the safeguarding of pregnant women's rights in the workplace, these amendments are just not financially viable to introduce at this time in the economic recovery. The implementation in the UK alone is estimated to cost close to £2bn. This is not only very costly for the UK, but to impose this stipulation across the European Union is unfair on those Member States who do not have the budgetary resources to support it. Further to this, implementing this particular amendment during a time of economic constraint may lead to increased discrimination against women securing jobs as maternity leave packages would cost employers more than ever before. Sharon has met with the Federation of Small Businesses on this matter who estimates each pregnancy will cost employers on average £7000. Thank you once again for contacting Sharon and I hope this response has been of use to you. Kerry McCarthy Labour MP for Bristol East was given a police caution today for illegally revealing a postal vote result on Twitter. I replied to Kerry's tweet at the time and I also reported this on Bracknell Blog when it happened, Bristol East are opening postal votes in the name of sampling and results are reported. I think a police caution is the right action. Kerry is very lucky as she could of received a 6 month prison sentence and a £5k fine. Today you may of noticed that we did something you don't agree with again. We know that this is not Liberal Democrat policy. We know you may of voted against this policy at one of the conferences. We know you put on the leaflets that we won't do this or indeed that. But we have just done the opposite of this in government anyway. That is because our policy was not realistic in these hard times or our Tory coalition partners right wing just can't stomach it. So we caved in, It is for the national interest after all. Yes we know it looks bad, maybe because it is bad? We also think it is a good idea to not release all of our plans that relate to the same subject together. Like say the CSR benefits cuts and IDS plans on benefits. We think it is best to do one thing at a time. Best to get the bad part of the story out the way first and then slowly add the good bits. If we get any small concessions on this thing you don't agree with then we will let you all know in a number of emails like we did with the Trident delay. We also think that our members don't really understand why we are doing this. Therefore I felt it was best if we sent out this patronising email to our members just so you can understand what fairness means. We will also keep on telling you that everything is fair even when it appears not to be. Believe us it is fair, everything we do is very very fair. Honest. I can pledge that it is very very fair. So don't worry about it. It's ok this is how it is when your in government. I know you love your party and it has taken decades to build the party up to the size it is now. It's not been easy. I know our hard working councillors are worried about losing their seats. Our activists are more nervous then usual about knocking on doors for claims of being a yellow Tory or some kind of sell out. Again stop worrying. I won't worry too much about Labour voters after all they just voted for their least worse alternative. But I also wouldn't worry about Liberal Democrat voters because they will understand won't they (Students,Teachers,the poor and Civil servants aside). I'm sure they will come back, won't they? Yes the public don't really understand how a coalition works. Problem is nor do we. Luckily we made this coalition agreement. We think it's really helpful if we keep telling voters that it was in the coalition agreement rather than Tory policy we agree with or Lib Dem policy the Tories agree with or a clear compromise between the two positions. I can say that we are all in this together because we as ministers stand a very good chance of losing our seats in the next general election. So we will hang on to the bitter end. After all we can always say we sacrificed our party for the national interest. What can be more noble than that! Green Gabbles has a word cloud on David Cameron’s speech at Tory Party conference. Asking Greenest government ever? Labour Cllr John Ennis thinks Osborne’s cuts are neither necessary nor are they fair. Michael Heavers blog tells us why Nigel Farage is the man to take UKIP to the next level. And finally this weeks entertainment is provided by BBC political reporter Nick Robinson who lost his cool. Half of woodland run by the Forestry Commission is to be sold. I just can't get behind that. One of the best things about Bracknell is the forest that surrounds it. It's free and well managed. We have deer, The Lookout, Go Ape and it is the home of caesar's camp. Forestry Commission trees cross the whole constituency and are inbetween all the villages/towns of Bracknell (Crowthorne, Bracknell and Sandhurst). I would not want to lose one tree to privatisation. It should be free for public use. MacKay asked to apologise but will he? Parliamentary Commissioner for Standards John Lyon has today has today said that "Mr Mackay's decision to claim that the property in Bromsgrove was his main home was a serious misjudgement which was sustained over more than 12 years." he also added, "Mr Mackay should have recognised that it was not right, or defensible, to come to an arrangement which he knew would mean that parliamentary allowances would be used to cover costs incurred on both his homes." Mackay and his wife Julie Kirkbride (MP for Bromsgrove constituency) have paid back £29,243 each earlier this year after Mackay claimed £1,000 a month for their flat in Westminster and Julie Kirkbride who claimed £900 a month for their house in Bromsgrove. Meaning that the couple had no main home. i.e no home that they were not claiming against and paying for themselves. The committee concluded that Mr MacKay should now apologise in writing and that if he had still been an MP, he would have been suspended and would have had to appologies to the house. Andrew Mackay of course still believes that he has done nothing wrong. So I'm not expecting to see an apology. but If he does I will publish it in full on this blog. Readers should be reminded that Andrew Mackay is now working for the lobbying division of the Burson-Marsteller and Julie Kirkbride is now working for lobbying company Tetra Strategy. It's not right is it Andrew? Please can you apologies to the people of Bracknell and recognise that what you did was wrong! If you need a reminder of the events leader to Andrew Mackay resignation then please have a read my blog here. Today Lord_Sugar tweeted 'Don't expect anything positive about me in Daily Mail best practice is what ever they say think opposite and you might have the right story'. I expect in relation to this Daily Mail article 'The Apprentice: Fired Dr Shibby Robati accuses Lord Sugar of being 'biased against professionals'. I have no idea if this is true or not. It is in the Daily Mail after all, so how could I be sure? Lord Sugar may have some dubious apprentices but he has a point, don't you think? As my readers will know I'm in favour of a slower payment of the debt. However even thought the spending review had plenty of bad news for many. I was pleased to see that there will be an increase of £2 billion in capital spending from Labours plans. As I blogged in Alan Johnson is right on capital spending. I was also pleased that the average departmental cuts is 19% rather than the 25% expected. Less than the 20% cuts that Labour planned. This will of course be used as political capital. It's worth bearing in mind that this is not all at once but spread over the four and a half years. The worse cuts for my political beliefs were the cuts in the Local budgets. I'm glad councils can borrow against future spending but this will only help to a certain extend. Good luck Bracknell Forest Council your going to need it. Cutting the Ark Royal is a strategic mistake. Defence. It is more important than some would have you believe. I have to admit that in these times I don't think Britain can afford and even pretend anymore to be a world power. Nor should it. Aircraft carriers are by definition a very multi purpose asset to the Royal Navy and in turn Britain. It is not only a good way of protecting far-off islands from attack but it can be used as a base for rescue operations, essential airlifts of equipment or suppliers and of course evacuations anti drug and pirate operations. It also gives Britain more independence and more options. Sharing carriers with France (who have had their own problems with the timings and cost of jet deployment) would make sense but is politically sensitive. Britain and France have similar requirements from their navies and they both need to be independent of the US. I suspect their will be some arrangement between Britain and France down the line. I'm pleased that their will still be a helicopter platform to carry out some operations but we are in trouble if we need to get involved in a conflict that requires naval air power. I personally believe that this particular military cut is a risky mistake. October 2010 - Ark Royal, the last of the current carriers in service to be mothballed with immediate effect. HMS Ocean, the helicopter carrier, will also be mothballed - the aircraft carrier HMS Illustrious will be brought back as a helicopter carrier. 2014 - Crew of Illustrious transfer to new super carrier HMS Queen Elizabeth for sea trials and Illustrious will be decommissioned. HMS Ocean will be brought back into service. 2016 - HMS Queen Elizabeth brought into service as a helicopter carrier and HMS Ocean decommissioned. 2020 - HMS Prince of Wales becomes an aircraft carrier with a scaled-down cheaper version of the new joint strike fighters. Its catapult launch system design will also be adapted to allow US and French strike fighters to be launched from it. It has been revealed that speed cameras cost the council around £97,000 per year and that they could be scrapped. If they are scrapped, what would you like to see them money spent on, or do you think speed cameras are worth spending money on? I have had some bad experiences with speed cameras. On one road the speed was changed (not in Bracknell Forest) and me, my brother and my brothers girl friend were all caught by this change on the same day, a bit unfair. The second time I was driving on a motorway when I was forced to go faster by a bad driver who I was avoiding, as they almost hit the back of my car along a slip road in road works. So it's not surprising that I think the money could be better spent on protecting vital services. There are very few speed cameras in the Bracknell Forest area anyway. I suspect other cheaper low maintenance measures would be more effective. Can taxpayers afford free tuition fees? BillBloggs sent the following email to tuition@libdems.org.uk where he gives a different opinion to the one I expressed in A pledge is a pledge end of . Under these dire financial circumstances, and following receipt of your very well put explanation and arguments for abandoning the LD election pledge to abolish Tuition Fees, you do have my full support. Free education to degree level is a great idea - IFour country (i.e. us taxpayers - not government )can truly afford it. Please don't let this coalition government offer anything else for free that we taxpayers cannot afford! Anything "free" always seems to be a great idea to voters - but why do these same voters keep forgetting that when any political party or government promises anything for "free" to us all - it is all of the taxpayers in the UK that are going to have to pay for it! Surely telling us taxpayers what it would cost to do this now and what we will have to do without on top of all the other cuts coming to us is the final clinching argument that you could put to persuade all those complaining now to be quiet? Mind you -Scrapping Trident would have gone a long way to offset the cuts elsewhere wouldn't it? However, I think that money if saved would be far still better spent elsewhere(e.g. green infrastructure hence green job creation) rather than on tuition fees. Frankly, I have always wondered how we managed to provide a university education for free for so long in the past. We must have been a very wealthy country once! I guess that is also why we have been so generous with our benefits system in the past too? Little knowing of course how that was going to backfire by creating so many dependants who have found it easier not to work and milk the system etc. I would like to add that, IMHO, a university education is being overrated in the UK anyway. All young people need jobs to go to, and a degree is wasted time and money if there aren't any jobs around that need you to have one. A hell of a lot of degree qualified people are in lowly jobs in the UK already. Time and Money wasted, wasn't it? What we really do need badly in this country is a restoration of our manufacturing industries, a boost to our farming and agriculture, loads of green jobs, and far more people in on -job training and apprenticeships - rather than becoming overqualified or qualified in unwanted subjects in universities. I also think that further education, particularly at degree level, could and should be financed much more by businesses and industry, and thereby the qualifications gained would be linked more closely to their needs. After all, they would get the benefit of these more highly and correctly educated people as a resource pool. Please bear in mind that Practical skills have a very important place in our society too, and please note that many of those people that we are now trying to get off of benefits and into work (Hooray for Ian Duncan Smith!) are just the sort of people who can be trained to do them. Surely this is what should be happening - rather than too freely letting the Eastern Europeans and other Immigrants come here and take jobs away from our own people? I write as retired Chartered Mechanical Engineer who got the necessary qualifications the hard way, not via a university degree but as an apprentice doing days and many evenings at Technical College, while I also gaining many sound and invaluable practical skills at the same time. I have had 40 years experience in industry, and I have worked with and employed many degree level and highly practically skilled, semi-skilled and unskilled people from all walks of life, during my career. IMHO this country needs to become far more self sufficient all round again, like it once was. What we are doing with continuous population growth and relying on getting ever more economic growth and increasing globalisation everywhere to support it all is simply not sustainable - certainly not for much longer. The planet we live on is of a fixed size with finite resources, so this must be so. Todays link is to Lib Dem Voice who also has a opinion article from Simon Kaye who is in favour of the Browne report. I was watching Alan Johnsons(shadow Chancellor) interview on Andrew Marr this morning. Alan brought up the subject of capital spending. I agree that this is a good idea (as does Cable and Obama). Capital spending means that we have a lasting asset like for example the Olympic venues, the high speed train link and say the proposed new aircraft carriers. But this of course includes building schools for the future (which is to be replaced which a smaller building program). Capital expensditure provides work and gives the country with a lasting usable asset. It's not employing administration staff for the sake of it. It provides economically viable jobs with something to show for it. I hope capital expenditure is taken into account in the spending review and I also hope that it's not only Alan Johnson and Labour who put pressure on to ensure there is some capital expenditure. It's nice to see the Bracknell Regeneration Partnership has been busy in one area. Their website for example http://www.bracknell.com has been up and running for a few months now. There is plenty of news and event details on the site etc but if you click on regeneration all you will see a short statement, but no actual news on the regeneration. Remember this is the Bracknell Regeneration Partnership website. So in other words, so far they have nothing more to add. No news is bad news in this case. I agree with some elements of Lord Brownes report into the future cost of tuition fees and university funding. For example I am pleased with the recommendations like scrapping upfront fees for part time students, protecting fees from certain medical and science and other important courses. I also agree with 30% of the poorest graduates paying less and could even go so far to say I like the idea that some of those Mickey Mouse degrees would not be taken up. I can even understand the reasons why the coalition will increase fees but what I don't understand is going back on a pledge. Why sign a pledge if you know its not possible to act on it. I just can't reconcile this point. I can defend most things on the doorstep, but I don't think I can defend this one, it just wont wash will it? Will the voter still understand that it is still Liberal Democrat policy to scrap tuition fees? Even if our leaflets confirm this they simply won't believe it. It's common for parties to go back on manifestos like when Tony Blair reversed the Labour Party's 2001 manifesto promise not to introduce "top-up fees" in the first place. Manifestos of course do not allow for changing circumstances and lack the flexibly required in government. I understand that being in government means making hard decisions and choices. But I think this is different. This is a pledge. A pledge to me is something you have to stick to. Student voters and their parents won't understand that Liberal Democrats abstained from the vote, this does not make everything alright. Even if your local Liberal Democrat MP voted against and increase in fees many will view the Liberal Democrats as a whole as going back on their pledge. Therefore I think voting against an increase is still not enough. Liberal Democrats should not agree to an increase and Cable should no be putting forward an increase. Perhaps it would of been better for a Conservative minister who didn't pledge to not increase tuition fees or scrap them (and some did) to be given this task, politically that would of made more sense. Needless to say, I am not very happy with the endorsement of Lord Brownes report by Vince Cable and Nick Clegg. I will wait to see what the coalition government decides to do and I will assess then what action if any I may take. In the meantime I recommend you right to your MP on this issue and others may want to join Lib Dems against scrapping the cap. Firstly I want to say thank you. Thank you to the people who left comments to my 'Fed up. So I'm going to stop blogging', Thank you all those on Twitter who asked me to carry on blogging. Thank you to the bloggers that linked to this post and asked me to continue (Walaa Idris for her open letter , Iain Dale and even Nadine Dorries). Thank you to Mark Reckons who emailed me and told me how much he enjoyed my posts. It was brilliant to receive encouragement and advice from members of all parties and none. I now have someone in the wings to check my blog posts, my grammar and my spelling. I plan to post less often as suggested my the Norfolk bloggers comment. I will read the books I have been recommended by my readers. I plan to not give in to Dyslexia. I will aim to improve. So its decided then. I'm back! and it's all down to you, Thanks! I'm fed up. Fed up with my bad English. My English is terrible. I failed English at school in part due to bad behaviour I think caused in part by my then stammer and dyslexia. I only got an 'F' in GCSE English and had to retake it at Bracknell and Wokingham college, doing an extra year there. I still only managed a very low mark in English but the college kindly let me take a national diploma course as they saw my potential in other areas. I love them for that. I also blame myself for not improving. Why the hell can't I do it. I'm not stupid. It should be bloody easy, Damn it! I hate it. Did I write that correctly? I have no idea, no bloody idea! I have tried to improve but I never see it, I just can't do it. I still have no idea how to use a bloody comma or use words like their or there or they and they're. Just basic errors. I find the English language a so so difficult. I have been using http://www.gcse.com/english/ to help me but it takes too long to go over every word again and again only to find errors. This blog has been a great help to my English but it has also highlighted errors. Errors that I am frankly embarrassed about. So it's been fun. this blog has opened up doors for me. I love replying to comments and geting a chance to break stories (only a few I know) and write opinion pieces. But now keeping track of my own errors is becoming a real hassel. So thank you one and all for reading, it's is your interaction that gave me the most enjoyment from blogging.I will still be on Twitter and if you do wish to follow mw my account is http://twitter.com/dazmando. Todays link is to Green blogger Steve Gabb, who I promised to link to for Bracknell the Movie. Enjoy! I agree with the readers of Get Bracknell in Little hope for town centre revamp.This comes after news that the Bracknell Healthspace will not be build in Market Street and instead will be build on the Skimped Hill Health Centre site. I can remember when I was at college looking at the plans for a new town centre and a few years ago looking again at an exhibition in town of new town centre plans (see here). I can remember surveys accross town with signs explaining that this is for the new town centre regeneration. I can remember promise after promise on when Bracknell work will begin on a new town centre. Yes a few things have happened. The train station has been improved, there are some new units with a Costa in one. We have a lovely new College but I remain so disappointed about the town centre itself. How much longer do we have to wait and will it ever happen. take a look at the town at the moment and try to tell me that it doesn't look old and tired and dull. The there is the top of Bracknell Harrods as its known. Remember when this was a department store. I love this town I just wish the regeneration happened because its a turn off. I like the rest of Bracknell are fed up of waiting so long for this to happen. This weeks Bracknell Standard has a little Q&A with myself. Heres my answers as submitted to the paper. What is your favourite food? Normally the food on the biggest plate. What is your favourite holiday destination? So far Japan, I just so enjoyed my trip there, the people, the food and the crazy cosplay costumes. What was the last book you read? The Dirt which is a biography of Motley Crew. Its a crazy rock n roll story that's just unreal. What is your favourite TV programme? currently Spooks but it was Waking the Dead and before that Star Trek. What was your first pet and its name? I have fish which I haven't named, maybe I should. What is your favourite film? That's a hard one. I guess Comedy it would have to be Austin Powers (all 3) but otherwise on the serious side it's Michael Moores Bowling for Columbine which is about the Columbine High School massacre. Still his best documentary. I wish America would do something about their gun laws. What painting or photo do you have on your wall or desk? A scan of my yet unborn baby. Who would your ideal dinner guests be? from politics I would take Boris Johnson and Paddy Ashdown. I think they would be the most interesting politics to hear lots of stories from around the table. Music I would go for Jimi Hendrix and Vernon Reid (Guitarist in a rock band called Living Colour) because I think Jimi is the great rock musician who has ever lived an Vernon because he's very intellectual, oh and Ozzy you have to have Ozzy. What car do you drive? I just sold my yellow mini which I loved. I now have a very boring Ford Focus. What is your biggest regret? Not going to university. What makes you smile? Life in general. What was your first job? Cleaner at Gateways in Crowthorne, had to get up early for that one then head off to school. 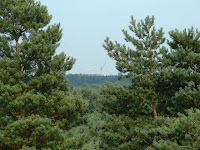 What do you like about Bracknell Forest? Well its certainly not the town centre or the 3M building. I think its the parks and the many cycle paths. You can travel all over Bracknell without touching a road. If you won the National Lottery, what would you do? I would help shelter the charity giving my time to them and I would actually afford to run for parliament as I would have the time to commit to it. If you could be asked one question what would it be and what would you answer? Would you ban certain video games? My anwser, No. Parents should pay attendtion to the age restrictions on video games. Games are a media just like films and they should be treated the same way. 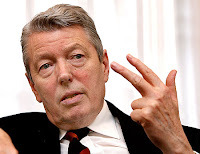 Ed Miliband has clearly changed his mind about winning over Liberal Democrat voters with the appointment of the highly authoritarian Alan Johnson. I freely admit that Alan is a big hitter and more popular than say Ed Balls who commentators expected to get the job. However was this not a chance for Ed Miliband to demonstrate how different he is and to demonstrate this new generation. I personally think a more radical and better appointment would have been Yvette Cooper. Even though this could of looked like a snub to her husband Ed Balls. I think Yvette Cooper would have been a refreshing change to shadow Chancellor. A missed opportunity to have an ambitious women as shadow Chancellor and to demostrate a different radical Labour party. Todays link is to Tory Blogger Walaa Idris who asks How is Alan Johnson a New Generation!? and Labour blogger Scarlet Standard who supported Ed Miliband and can see internal and external political advantages of putting Johnson in the role. All parties have their own forms of democracy. I'm sure that none are perfect and it is for that party to choose or change their internal democracy. But Labours electoral college and elected shadow cabinet does appear to have some floors that could be improved and updated. Today Labour will announce their shadow cabinet today. This brings up the question of not allowing the Labour leader to select the shadow cabinet. Ed Miliband will have to rely on those who are voted in through the Labour parliamentary party. Jack Straw on BBC Five Live today said "It's fine if your not in the shadow cabinet because those appointments are made on a rational basis by the leader. If your in the shadow cabinet, the shadow cabinet is elected. I from a position of complete neutrality said to my colleagues, look I survived and prospered by this systems for 10 years. But I'll just tell you its barking mad. Because for arithmetical reasons as well its a daft system. what it means is that of the 18/19 people in the shadow cabinet probably a dozen are capable of being in the cabinet half a dozen are not and if and when, and it will be when we have a Labour government some of those people who thought it was a kind of meal ticket into the proper cabinet will be sorely disappointed. Nicky Campbell "then asked will you come on in a few days and with Mandelsonian candour tell us the half a dozen who are not up to it?" Jack Straw replied "Err no. Because if I did come on in a few days I would say to you that their all appositely fine. and indeed, but here's the point Nicky, I won't know, because it's the front bench as in the shadow cabinet is an interesting test of people character and ability. So you don't necessarily know immediately. Although what I do know is that if we left the decision of shadow cabinet as we left the decisions about the cabinet to the leader, people may say it gives them too much power but it actually gives them a great deal of responsibility." The whole interview can be heard here (from about 2hours 10 minutes in) and includes some interesting comments on Peter Mandelson book. I agree with Jack Straw on this. This process has an element of a popularity contest. MP's will need to stay on the good side of their fellow members. Not bad thing you may say, but this lack of control for any leader is no good thing for bring about a sense of leadership and for getting the members in the cabinet who would work best with you. It's possible that those MP's you don't get along with will also be the MP's that stab you in the back. I keep hearing about how Liberal Democrats want a graduate tax. This came up again on today's BBC Breakfast during the interview with David Cameron. I feel I must correct the BBC on this. Liberal Democrats still want to scrap tuition fees and do not want a graduate tax. It is not Liberal Democrat policy. But it is a proposal Lib Dems would be willing to support. The graduate tax is a coalition proposal put forward by Vince Cable as a progressive form of tax. It's an idea to help fund higher education when austerity measures are required. It is not a permanent solution but a necessary measure in these times. Another misunderstanding is that some believe the graduate tax proposal is on top of tuition fees. It's not. The Graduate tax is a replacement for tuition fees and is not in addition too them. I really wish the media would try to understand the difference between a coalition proposal and party policy. At the moment the media seem happen to confuse the public. Details can be found on this money Q&A: What would a graduate tax mean? Scrapping child benefit - what will Ed do? I was watching BBC Breakfast this morning when the Chancellor did something politicians never do. Osborne was asked a question by Shan Lloyd about universal benefits and he answered it by announcing a new policy that is within his speech (scrapping child benefit for higher rate tax payers). This is not the normal way of doing things in politics. Normally you don't answer the question and you certainly don't announce a policy before giving a speech to party conference and not without leaking bits of your speech to the press first. I found this quite refreshing. Anyway others will cover the rights and wrongs of this announcement in detail as this is a big story because it moves the Tories to the left. However I was wondering about how Ed Miliband and Labour will deal with this announcement. Ed has a chance to move right or left of this debate and maybe remove his Red Ed tag. He could agree with this cut, thereby showing that he is progressive and also doesn't agree with universal benefits or he could disagree with all or part of this announcement. If Labour do this then are they not moving to the right of the coalition on this issue and thereby removing his Red Ed tag? I look forward to the Daily Mail's headline tomorrow on middle class benefits being cut. 'Hospital loan not a bail out' - A GOVERNMENT loan of £18million to the trust that runs two hospitals in Ascot and Slough is “not a bail out”. Family homeless back on Civvy St - A war veteran, his wife and their two sons are having to live in a single room at his parents’ because they do not qualify for council support. Benedict Brogan on the Telegraph blog covers Lady Warsi accuses Asian community of electoral fraud - A blog that I enterly agree with. And that's it for now. Have a good weekend!